This is one of those recipes that always come in handy when in a hurry. It’s really tasty and a good comfort food for the cold winter days. I got this recipe in Cadereyta, a small town located in the northern state of Nuevo Leon, on one of our many trips between Monterrey and Texas. From time to time, we would stop to grab a bite at a small roadside stand where two young women used to sell tacos. They only had 3 types of filling for their tacos: beef tongue, picadillo, and this guajillo pork stew. You never know where you’re going to pick up little bits of cooking wisdom from, and those ladies were glad to share theirs. They called this dish Asado de Puerco/Pork Stew since that is a very famous name for a dish popular in the area, but everyone has their own particular way of cooking. It is also known as Chile Colorado, using local peppers from Sonora and Chihuahua, where they also add vinegar and flour, which acts as a thickening agent. This version has fewer ingredients but is tasty nonetheless. The women just gave me a list of ingredients, with no quantities, measurements, or cooking times. But it is now a classic, not only in our home but at some of my siblings’ homes, too. You can use other types of meats instead of pork, like chicken, shrimp or beef. The leftovers taste even better the next day and are a popular filling for tacos or gorditas. For a more elaborated recipe of Asado de Puerco, click HERE. While the peppers are cooking, add the meat and bay leave into a the skillet and cover with 1/2 cup of water. Simmer in a low heat until meat is tender. About 20 minutes. Place peppers and garlic in the blender with 1 cup of the water where they were cooked, cumin and Mexican oregano. Process until you have a smooth sauce. Pour sauce into the skillet with the meat and keep cooking in a low heat. Use a strainer to pour the sauce in case it isn’t smooth enough. Season with salt and pepper and keep simmering for about 10 more minutes. After that time, any fat from the meat will float to the sauce surface like in the picture above to the right. 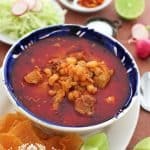 Guajillo Pork Stew - This is one of those recipes that always come in handy when in a hurry. It’s really tasty and a good comfort food for the cold winter days. 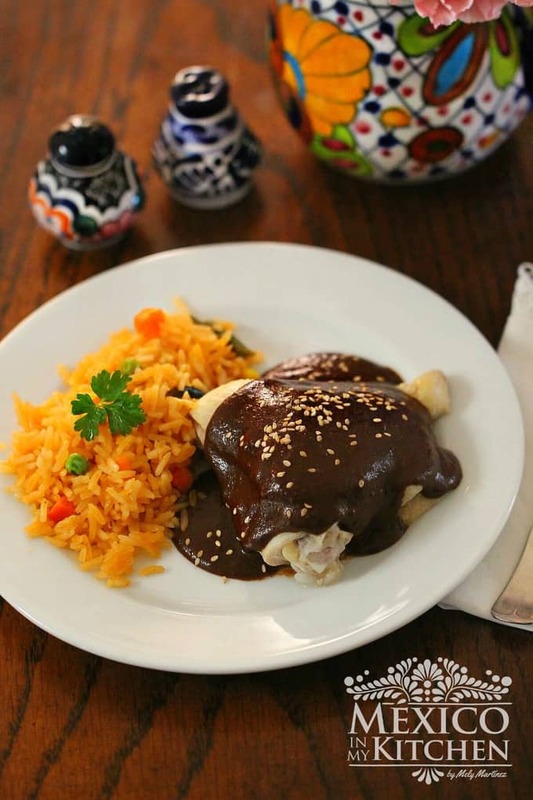 I got this recipe in Cadereyta, a small town located in the northern state of Nuevo Leon, on one of our many trips between Monterrey and Texas. 6 guajillo peppers cleaned and deveined. Place Guajillo peppers and garlic cloves into a saucepan and cover with water. Cook for about 15 minutes until peppers are soft. Place peppers and garlic into the blender with 1 cup of the water where they were cooked, cumin and mexican oregano. Process until you have a smooth sauce. Serve with white rice and a salad. Enjoy with warm tortillas. • The sauce(Adobo) for this stew is a key ingredient for many dishes like enchiladas, tamales, pozole, menudo, etc. If you have the ingredients and the time, make extra and freeze for later use. Black Beans and Pork Cracklings Tamales. Mely, es justo como lo hace mi suegra, idéntico, y a mis hijos les gusta más el de su abuela! Ya se me antojó muchísimo! I love recipes like this. Sounds wonderful. Pinning this one. Buena receta… nosotros de los Cavazos, Nuevo Leon – ponemos una pizca de clavo y un poco hueso de aguacate. This looks amazing! Do you think it could be done in a slow cooker? No I didn't I cooked them in the water a stated, will the roasting change the bitterness.. Try adding a touch of sugar… start with a quarter of a teaspoon…does it for me. Hello I am a Canadian living for more than nine years in Oaxaca. I found this recipe after buying a bunch of Guajillos for a different meal and was looking for ideas. I made it basically the same but added a bit more water. potatoes, carrots, celery, chayote, mushrooms, and onion. just like in a stew from home. Simmered it for a wile and thickened it with a rue. Thank you for this recipe. I added a couple chile moritas for extra complexity (Or rather I just wanted experiment). Also I just put the salsa on the meat without searing first and stewed for 3 hours in the oven. So rich and tender with great heat. Will be making again without the chile morita to compare next time. Thank you for letting us know about your addition of morita peppers, such a great idea. Next time, I will try your version and bake as you mention. Can we just use whole oregano. Hello Belinda, do you mean fresh oregano? And not whole oregano? Made this recipe…it was excellent! I have made it several times since and is one of my favorites. So glad to know you enjoy it. If you let the meat cook a little longer until very tender, it is perfect to make tacos with flour tortillas and served with a salsa ver.